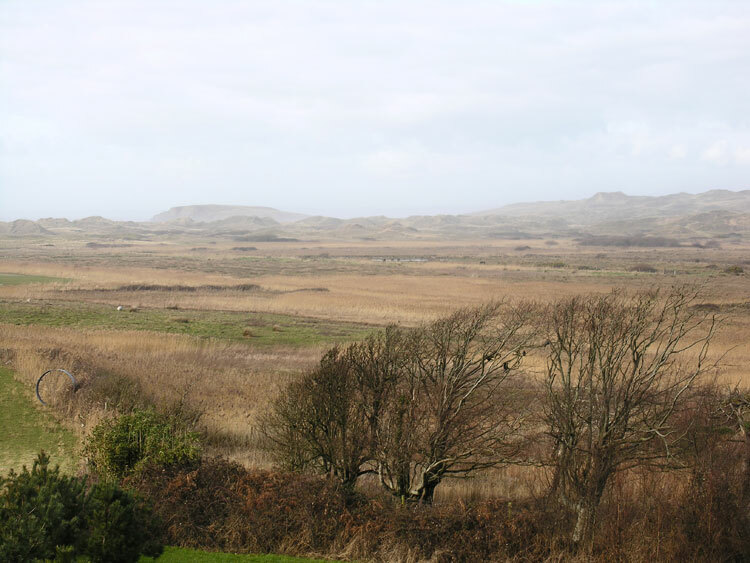 The historic landscape area of Llangennith Moor equates to the extent of reclaimed lowland just northwest of Rhossili Down as well as the farmstead of Hillend at the edge of the sand dunes. This area is situated in a low lying area of former marshland cut off from the sea by Llangennith and Hillend Burrows (HLCA 009), probably formed during the medieval period. Little archaeological evidence is known from this area until it was reclaimed during the nineteenth century when a number of drainage ditches were constructed to canalise the water. The main outlet for the water is now through the burrows via Diles Lake to the sea. Almost completed by the time of the tithe in 1847, this semi-regular field system is probably the result of a piecemeal approach to reclamation to improve land for pasture. Named as Hills End on an early nineteenth century estate map, the farmhouse is likely to be eighteenth century in origin with nineteenth century extensions. The farm and land at Hillend is now used as a campsite and surf school. A few modern cottages have also been constructed on the periphery of this character area.